Posted on March 26, 2015 by Mark Wilson in ICT. Making it easier to post homework, quizzes, exams and handouts for students. Enabling individualized student feedback on work in one place virtually anytime and anywhere. Allowing a safe and monitored collaborative digital space where students can work together while also giving teachers the ability to coach and monitor information in real-time. All of this and more without requiring any additional infrastructure or software. The only thing required of you or your Office 365 administrator is to install the app once for all teachers. Teachers can do all the setup needed through their OneDrive for Business account so it doesn’t require SharePoint sites to be enabled. All of the instructions for installing it can be found here: http://aka.ms/OneNoteEduInstall (interactive guide here) and it only takes a few short minutes to add this to your Office365. There is a great interactive tutorial on OneNoteForTeachers.com that takes teachers through the steps on setting it up here: http://aka.ms/OneNoteEDUGuide (interactive guide here). 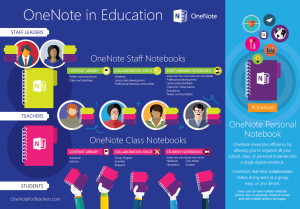 OneNote Class Notebook Creator allows teachers and students to make additional use of technology resources you already have within your school. Plus i think OneNote is such an underrated tool which has been around and included in your office licencing for years, i use it to take all my notes down but then get access to these notes on all my devices (yes that includes my iPad/iPhone and android devices!) so i can always access my notes when i really need them! Posted on March 25, 2015 by Mark Wilson in ICT. Posted on March 24, 2015 by Stephen Dolman in Finance. Posted on March 20, 2015 by Stephen Dolman in Finance. Posted on March 18, 2015 by Stephen Dolman in Finance. Posted on March 12, 2015 by Stephen Dolman in Finance. Posted on March 12, 2015 by Mark Wilson in ICT. Posted on March 4, 2015 by Mark Wilson in ICT.